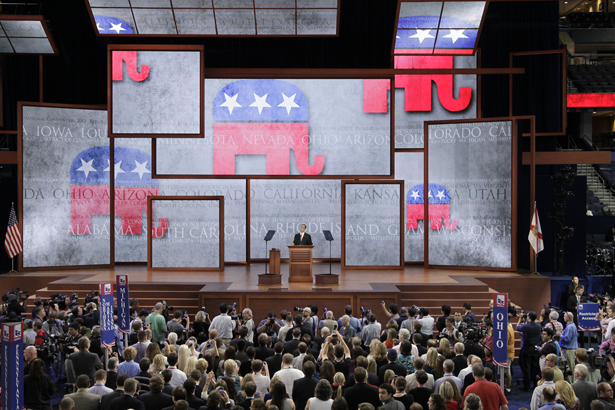 Mitt Romney had hardly conceded before Republicans started fighting over where to head next. Some Republicans—and many Democrats—now claim that the writing is on the wall: demography is destiny, which means the GOP is going the way of the Whigs and the Dodo. Across the country, they see an aging white majority shrinking as the United States heads for the future as a majority-minority country and the Grand Old Party becomes the Gray Old Party. Others say: not so fast. In the month since 51 percent of the electorate chose to keep Barack Obama in the White House, I’ve spent my time listening to GOP pundits, operators and voters. While the party busily analyzes the results, its leaders and factions are already out front, pushing their own long-held opinions and calling for calm in the face of onrushing problems. Do any of their proposals exhibit a willingness to make the kind of changes the GOP will need to attract members of the growing groups that the GOP has spent years antagonizing like Hispanics, Asian-Americans, unmarried women, secular whites and others? In a word: no. First, they cite the Romney factor: a weak candidate, too moderate—or too conservative—who failed to fight the Obama campaign’s early efforts to paint him as an out-of-touch plutocrat. In other words, his history (Bain Capital and Romneycare) depth-charged him before demographics could even kick in. He was, unfortunately, the perfect quarter-billionaire candidate for a Democratic narrative that the GOP is only out for the rich and doesn’t “care about people like me.” (He predictably lost that exit poll question by a margin of 81 percent to 18 percent). Running a “vulture capitalist” (and a Mormon) drove a number of Republican voters to stay home or even—gasp!—vote for Obama. It’s a mistake that won’t be repeated in 2016. Third, they emphasize the powers of incumbency. Romney became the presumptive front-runner only because the GOP’s A-list—mostly too young in any case—feared the huge advantage an incumbent president enjoys and stayed home. Twenty sixteen, they swear, will be different. Nor do they seem to fear a reprise of the 2008 and 2012 primary circuses because the A-listers in 2016, they insist, will all have well-established conservative bona fides and won’t have to bend over backwards to cultivate the conservative base. Still, they kept their majority in the House of Representatives, losing only a handful of seats. (That the GOP lost the majority of total votes cast gets less attention.) the party also added a thirtieth governor to its roster, and held onto its control of the majority of top offices and legislative chambers in the states. Come 2014, GOP operatives expect the party to do quite nicely, as the opposition party often does in midterm elections, especially if turnout demographics look like 2006 and 2010. Another lesson many movement conservatives have learned is that the more they pound away on their issues, the more they shift American politics rightward even when they lose. * Whites: About three-quarters of the electorate (and 88 percent of Romney’s voters) this year were white, but their numbers are steadily sinking—by 2 percent since 2008. Yes, many whites may have stayed home this year, turned off by Mr. Car Elevator, but whites are projected to become a demographic minority by 2050—or possibly even before 2040—and minority births are now outpacing white births. * Hispanics: According to The Washington Post exit polls, Obama received 71 percent of the Hispanic vote in 2012 (67 percent in 2008). Already 10 percent of this year’s voters (9 percent in 2008), the Hispanic population is exploding, accounting for half of US population growth. * Asian-Americans: The nation’s fastest growing demographic group—now 3 percent of this year’s voters (2 percent in 2008)—gave Obama 73 percent of its vote in 2012 (62 percent in 2008). * Unmarried Women: The percentage of unmarried women has been growing slowly since the 1970s, up to 53 percent of women as of last year. Even among subgroups favoring Obama, there was a marriage gap in which unmarried women (23 percent of this year’s voters) favored Obama by huge margins. Despite winning 53 percent of (mostly white) married women, 31 percent of this year’s voters (down from 33 percent in 2008), Romney lost women overall by 11 points. * The Young: The millennial generation (born between 1978 and 2000) has been voting overwhelmingly for Democrats (66 percent for Obama in 2008, 60 percent this year). They are projected to be 40 percent of the eligible voting pool by 2020. Because they are relatively diverse and secular, the GOP cannot assume that enough will emulate previous generations and swing to the right as they age. Such polling figures should frighten GOP leaders. There’s no reason to believe that what we saw on November 6 was anything but the tip of the iceberg. Like right-wing pundit Fred Barnes, many movement conservatives and Tea Party leaders will continue to insist that whites are going to remain “the nation’s dominant voting bloc…for many elections to come.” Hedging their bets, they have decided to become more “inclusive” or at least just inclusive enough in these days of micro-targeting and razor-thin election margins. After all, Romney would have won New Mexico, Florida, Nevada and Colorado if he had captured even slightly higher shares of the Hispanic vote, and he could have won in the Electoral College if fewer than 200,000 voters in key states had switched their votes. To get more inclusive, however, these leaders offer an entirely cosmetic approach: emphasize the party’s middle-class message, increase outreach or “partnership” with Hispanics and Asian-Americans, back off the anti-immigration message a tad, say fewer stupid things à la Akin and Mourdock, cross your fingers, and hope for the best. As if what the middle class really wants or needs is “choice” in education (Jindal’s plan to divert tax funds to private and parochial schools through vouchers was just ruled unconstitutional); “choice,” not affordability, in healthcare (the #1 cause of personal bankruptcy in America); and ever more environmental pollution, as well as further challenges to getting workman’s comp if you get injured on the job. The party’s modern history began when business leaders got politicized in response to the New Deal and then the GOP began courting the Dixiecrats after President Lyndon Johnson signed the Voting Rights Act in 1965 (despite knowing that he had “just delivered the South to the Republican Party”). The white South started voting for GOP presidential candidates in the Nixon years, and would soon become solidly Republican. At 70 percent of the electorate (nearly 90 percent in Mississippi), it remains so today. So the GOP can say that it wants to and plans to like Hispanics, Asian-Americans, unmarried women and secular youth, but to be believable, merely easing off on its anti-immigration message or going quiet on abortion won’t do the trick. And if it wants to prove that it cares, it will have to put some real money where its mouth is. To really go after the groups it needs, the GOP would have to do the inconceivable: drop the “entitlement reform” racket, open the wallet and reach below a restrictive definition of the middle class. It might, for instance, mean adding more money to the food stamp program, rather than poking fun at the “food stamp president,” because a full quarter of Hispanics and 35 percent of Hispanic children are poor. It would undoubtedly mean supporting equal pay for equal work, which the GOP has consistently opposed. It would mean working to make healthcare more affordable for everyone. That’s how you prove you care in politics—and it would also be good for the nation. But come 2020, 2024 or 2028, whatever’s left of the GOP is going to be kicking itself for not having built a foundation of anything other than words that no one outside its rank-and-file actually believed. Texas, after all, could go purple 2020 or by 2024. Of all the signals emanating from the GOP since Election Day, perhaps the most significant came last week when the socially and fiscally conservative Tea Party kingmaker Jim DeMint voted with his feet. The man who would rather have “thirty Republicans in the Senate who believe in principles of freedom than sixty who don’t believe in anything” is leaving that body for the Heritage Foundation—a hint about the future of what is arguably the most important GOP organization in the country.